Well, of course I'm taking longer than I plan on taking for this next strip. Myeh :(. But! Much of it is already drawn; it should be up later tonight (Sunday). 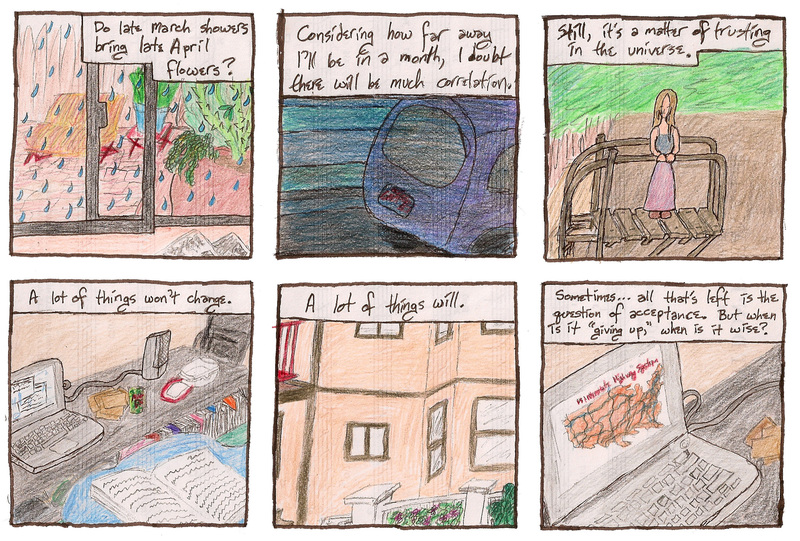 Haha, I was so bad at moving I didn't get my last comic up before leaving California :(. I was going to post it from the friends' place I was crashing at a few days before taking off across the country. Wow, I'm bad at moving. You'd think I'd be better at it, with how much practice I've gotten in the last ~4 years (living in a house where everyone changed rooms every three months, moving for summers, etc), but I'm using the excuse that I've always either been moving short distances, or moving by airplane (and ditching most of my stuff in storage because I'd be back in a few months). Now? I'm trying to move cross-country, fitting everything I own in a single car trip. ...yea, I'm not the most acquisitive character, but I ♥ books, and those are heavy and bulky :(. Oh, but I wouldn't give up being a linguaholic for a day :). I am also, of course, freaking out about gas prices. This may be the dumbest time to take a 3,000+ mile drive ever. Ah, well. ;) It's something everyone's supposed to do once in their life, right? Cross-country roadtrip?